Hi, I’m Sandra, clinical lead for the respite team. I have worked with the team for nearly 5 years, clinical lead for 2.5 yrs and I started working at age 16 with children with complex health needs in the community. This led to me becoming a foster carer in Liverpool. I then trained as a learning disability nurse and later as a children’s nurse. 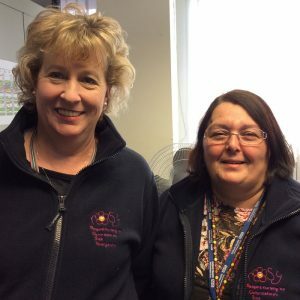 I have worked as a special school nurse, children’s hospice nurse Marie Curie palliative care nurse and at John Radcliff hospital before joining the respite team. I love the diversity of my current role, meeting all the children and families, delivering hands on care and support and increasing the number of staff available to do so. None of this would be possible without the support of Rosy. Through your support we have increased the number of children and families on our caseload up to 72 with 6 families waiting for assessment. It is a privilege to work with Rosy. Hi, my name is Elizabeth Hill, although my friends and colleagues know me as Liz. I have worked with Rosy for six years. Previous to working within the respite team I was a TA in school part-time. This was a job I had done for 12 years. As my own family grew up and left school I decided to work full time and joined the team. I love working with families and children, being able to make a difference to a child or family in difficult circumstances is a privilege. There are definitely some very difficult days and situations to deal with but these are far outweighed by the positive days. Since joining the team I have been involved with a few end of life situations which I find extremely satisfying. To be able to support families at such an incredibly difficult time is something I am very proud of. I am also coming to the end of studying for a Foundation Degree in Health and Social care which will enable me to progress further within the team. 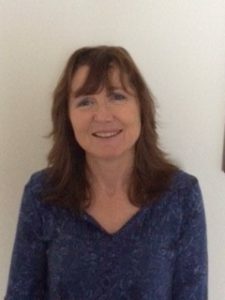 I have worked as Health Play Specialist since I qualified in 1993, initially in a general hospital and I moved in to the community in 2003 where I work with the Community Children’s Nursing team in Oxfordshire. Initially supporting the respite team with patient care and my using my play skills across the whole team. I took the lead in putting together sensory play boxes for the team to use in their sessions. I have attended Rosy coffee mornings and events. For several years due to work load and I moved out of the respite team and HCA post was developed in the respite team. I focused on the Play Specialist role. I am now based back in the Respite team but with the sole focus of play and writing play plan plans for the Respite team to follow. I offer advice to parents and colleagues and provide play sessions to promote and demonstrate play, reduce anxieties aid in treatment and rehabilitation. Most of the time I work autonomously offering play sessions in the home and occasionally school. I really enjoy supporting children to cope with medical interventions and the opportunity to work alongside my colleagues, supporting then and the children to have fun and promote development. Other work experience since leaving school include volunteer and play leader supporting children with disabilities, Nanny, Nursing Auxiliary on adult and children’s wards, Registered Childminder and being a parent. My name is Ursula Madel. I am a qualified Children’s Community Nurse and have been working as a regular sessional Respite Nurse for nearly 5 years with the Rosy team. I qualified as a Registered Sick Children’s Nurse in 1970 at Mainz University Children’s Hospital in Germany. I came to England in June 1970 and worked for a year in Great Ormand Street Hospital in outpatients department and operating theatre, which was mandatory for me to get my RCN registration, as these departments were not covered practically during my children’s nurse training. Once I received my English qualification I worked in cardiac intensive care. After a year ( I had originally intended to go back home) I went to Oxford, decided to give nursing a break and studied at the college of further education English O level language and literature and then 3 A levels in German, Zoology and Psychology. After two years I had completed the courses and wasn’t sure what to do next, so I got back to children’s nursing in Oxford on a general children’s ward. 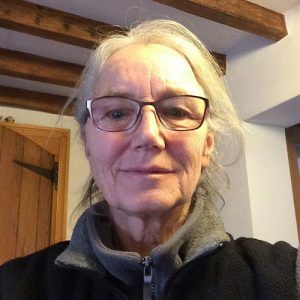 I had a bit of a break, had two children and worked part time for many years in children’s psychiatry , in the John Radcliffe on all the different children’s ward and later as a full time nurse at Banbury Children’s ward. I left there and did a 6 month course at Great Ormond Street Hospital in Children’s Oncology Nursing. After that I consolidated my new acquired knowledge on the Oncolgy ward in the John Radcliffe Hospital. I then studied for 15 months to become a children’s community nurse. After qualifying I was a generic community nurse in Aylesbury and then a oncology community nurse in Oxford. I then took on a challenge setting up the first post as a children’s gastroenterology nurse at Oxford. During that time I studied part time for a BaHonours degree in nursing studies at Brooke’s University. After a few years I took on another challenge , setting up a children’s community nurse team at Burton on Trent from scratch. After three years I took a break to help looking after my ageing parents. I then became Lead Nurse in a residential Special Needs School in Chipping Norton which due to funding problems closed its doors in 2013. It was time for me to retire, but I wasn’t quite ready for that and thus joined the Children’s Respite Team. I am still there and enjoying my post, being able to give holistic care to our young children on our case load, using all my skills I have obtained over the years. It is a wonderful team. Sarah Children’s Nurse, working with Rosy for 2 and a half years. Working as a children’s respite nurse for ROSY encompasses and enables staff to give compassionate, holistic and child and family focused care. This type of care is so important to be able to give to children and their families and enables health care professionals to walk alongside them in their journey. It’s an absolute privilege to be invited to care for children and families this way in their own homes.